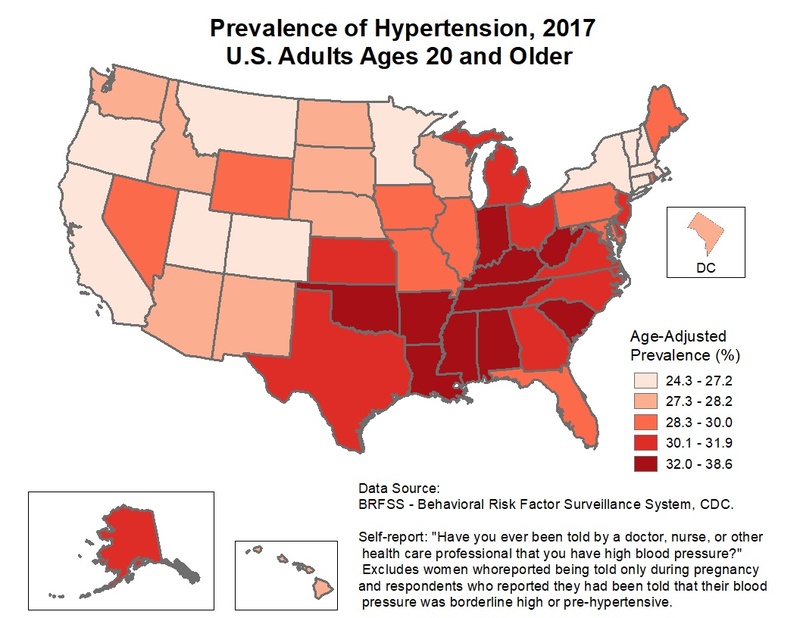 High blood pressure is one of the biggest health problems in the U.S. today. The CDC estimates that 75 million American adults, about one-third of the adult population, has high blood pressure. 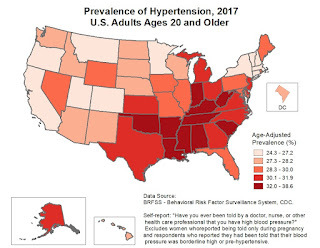 Even more alarming is that high blood pressure "was a primary or contributing cause of death for more than 410,000 Americans in 2014," the last year for which the CDC reports data. One of the main causes of high blood pressure (a.k.a. hypertension) is too much salt in the diet. As Americans have eaten out more and more, they've grown less aware over how much salt goes into their foods. Salt is tasty but invisible: you can't know exactly how much salt is in your food if you didn't prepare it yourself. Everyone knows that fast foods can be salty, especially those (like French fries) that have salt sprinkled all over them. 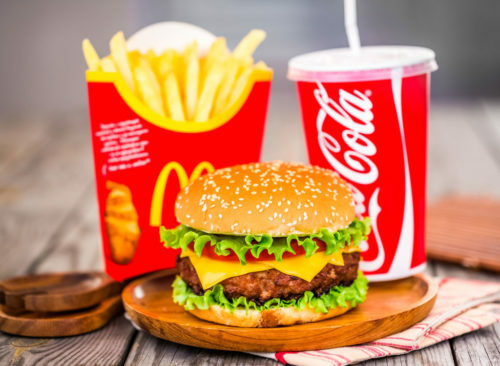 What they don't know, though, is that over the past 30 years, the amount of salt in fast foods has increased dramatically, as revealed in a new study just published by Megan McCrory and colleagues at Boston University. They would have looked at more, but others either didn't have data available or didn't have foods in all the categories under study. Portions and calories all increased over the past 30 years, but I want to focus on the salt. Back in 1986, sodium content in entrees averaged 36% of the recommended daily allowance–which is pretty high for a single entree (a burger, say). Bad as that is, though, by 2016 this had increased to 47%. Thus a single fast-food entree has nearly half of an entire day's allowance of salt. Sides increased from 14% of the RDA to 26%, which means that if you have an entree and a side (fries! ), you're getting 75% of your daily salt allowance. On average, they're adding 50% more salt today than in 1986. I remember having fast food burgers and fries back in the 1980s, and they were quite tasty. I haven't noticed that they taste better today, and it's not clear why the chains increased the amount of salt so much. Presumably they did consumer testing and found that people like more salt, but it could also be simply that adding salt, which is a preservative, allows them to store the food supplies longer and save money. Now, most people don't think fast food is healthy. It's popular because it tastes good and it's convenient. Nonetheless, for the large numbers of people who have high blood pressure (or pre-hypertension), the fact that salt has increased should be worrisome. For those who want to do a little homework, you can easily find detailed nutrition facts for all the major chains online now. It took me only a few seconds to find downloadable lists for McDonalds, KFC, Wendy's, Subway, Burger King, and others, so you can compare all their items before your next visit. For example, a McDonald's quarter pounder with cheese has 1110 mg of sodium, or 46% of your daily allowance. Their Bacon Smokehouse Artisan Grilled Chicken sandwich has far more, 1940 mg (81%), while their Filet-O-Fish, in contrast, has only 560 mg of sodium (23%). Side dishes can be surprisingly bad (or good) too. KFC's corn on the cob is a gem, with no sodium at all, but their BBQ baked beans weigh in with 820 mg of sodium. The bottom line, though, is that if you want to eat less salt, the best way is to prepare your own food. It's more trouble, but it's well worth the effort.